3.13.2019 – Remember this date! 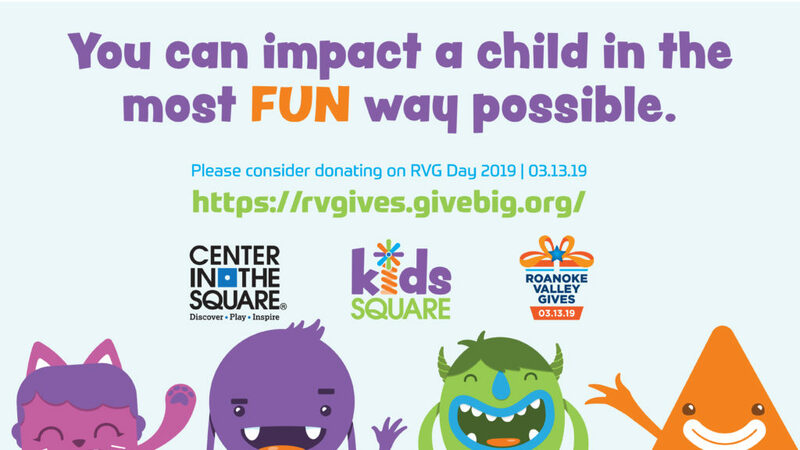 This will be Roanoke Valley Gives Day…remember us and GIVE WHERE YOU LIVE! Center in the Square asks that you, give where you live. Which includes the Kids Square Pay to Play Scholarship program. Every Child deserves a safe place to explore, play and learn. Fund a student, fund a classroom, or fund a school. –More than 15 million children in the United States younger than 18 years live in poverty. –Many of these children are deprived of the benefits of safe and creative playtime. The Pay to Play Scholarship Program is an opportunity for our community to pay for a student(s), classroom or schools to take a field trip to Kids Square at an extremely discounted or free rate. You can impact a child in the most FUN way possible.